Aren’t strawberries and lemon just the greatest combination ever? 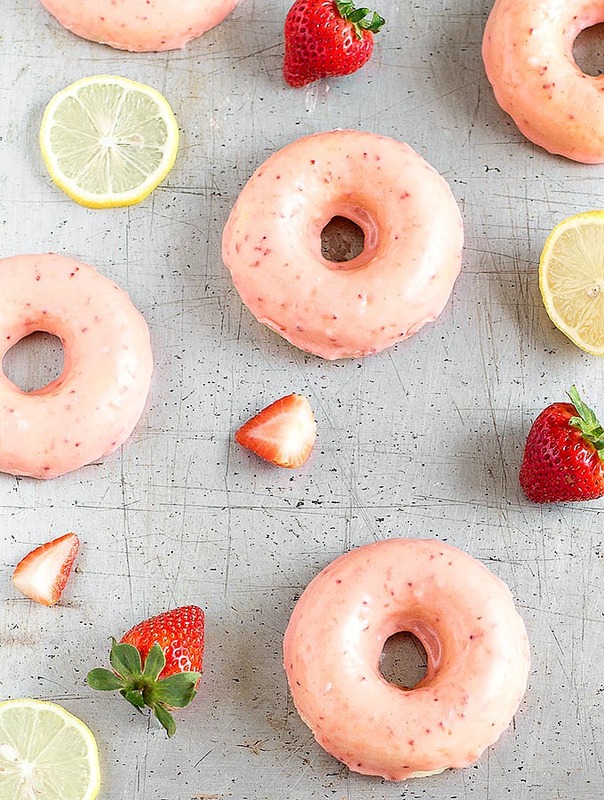 Strawberry lemon baked donuts are soft, tender, fresh and bright…perfect for spring! These baked donuts have become one of my favorite weekend breakfast treats. They only take about 20 minutes from start to finish and they are much lighter than the fried version. You also don’t need any fancy equipment ..Two bowls, a whisk, a spatula and a Ziploc bag to pipe the batter into a donut pan. If you don’t have a donut pan, you can use a muffin pan (just add an extra 10/12 minutes to the baking time). 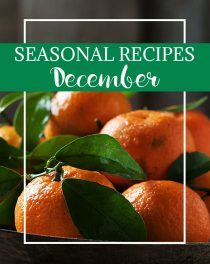 Simply combine the dry ingredients first, then gently whisk in the wet ones. 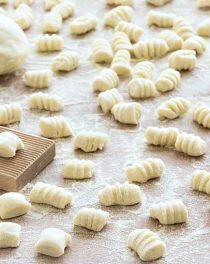 Transfer the batter to a zip lock bag, cut off the tip, fill the pan, and bake. Super easy! While the donuts cool, prepare the strawberry glaze. Whisk together powdered sugar, fresh lemon juice, and mashed strawberries. The sweet strawberry glaze pairs wonderfully with the tangy lemon donuts. Make sure you generously grease your donut pan before filling the molds. If you don’t, they will stick. I used a zip lock bag to pour the batter into the donut pan but you can also use a spoon or a pastry bag. Be careful not to overfill the pan cavities or the holes in the middle will close up. Donuts are best when eaten the same day but can be covered and stored at room temperature for up to 3 days. You can freeze unglazed donuts for up to 2 months. 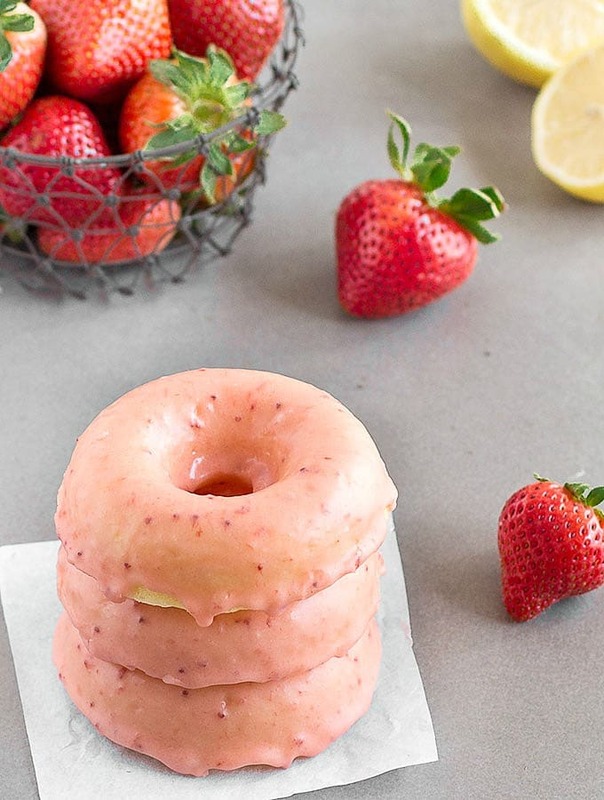 If you try these strawberry lemon baked donuts, I’d love to hear what you think. Leave a comment and don’t forget to take a picture and share it on my Facebook page or tag it #aseasyasapplepie on Instagram! Aren’t strawberries and lemon just the greatest combination ever? Strawberry lemon baked donuts are soft, tender, fresh and bright...perfect for spring! In a large bowl, whisk together the flour, baking powder, salt and lemon zest. In a small bowl, whisk together the egg, sugar, milk, butter and lemon juice. Add the wet ingredients to the dry ingredients and stir until all the ingredients are combined. Try not to over-mix the batter. 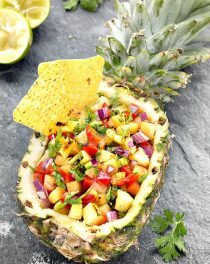 Place the pan in the oven and bake for 8 to 10 minutes or until a toothpick inserted into the middle comes out clean. While the donuts cool, prepare the strawberry glaze. In a medium bowl whisk together the powdered sugar, mashed strawberries, lemon juice. If the glaze is too thick, add more lemon juice, ½ teaspoon at a time until the desired consistency is reached. Once the donuts are completely cool, dip them into the glaze. 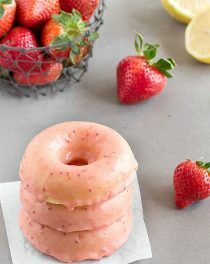 Return the strawberry lemon baked donuts to the wire rack and allow the glaze to set for about 30 minutes before stacking or serving. Well aren’t these beautiful and FUN! If I made them in a muffin pan, would they basically just be muffins or is there something different about them? Sorry might be an ignorant question. I have just never made donuts before.